The Mid-Sun Community Association strives to enhance the quality of life of the communities of Midnapore and Sundance in southeast Calgary by providing a voice, as well as direction, to meet the expressed needs of residents. The Mid-Sun Community Association was founded in 1977, and serves the 18,000+ people residing in the communities of Midnapore and Sundance, as well as other residents of south Calgary. The current facility was built in 1987; expansion plans are currently undergoing review. The Mid-Sun CA is a founding member of the South Fish Creek Recreation Complex, and a member of the Trico Family Leisure Centre. Representatives from the Mid-Sun CA sit on the governing boards of both of those organizations. The Mid-Sun CA strives to offer accessible recreational programming, and a venue for fostering community spirit. The success of the Community Association is due to the efforts of a great many volunteers, and residents who support the association. Thank you for your participation! 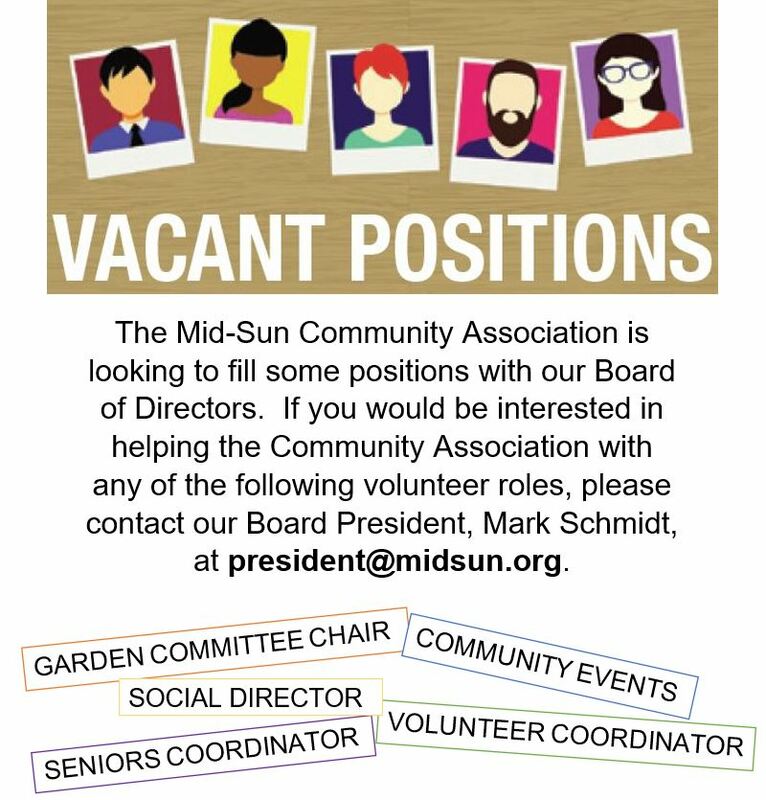 The Mid-Sun Community Association strives to create a spirit of belonging and cooperation for everyone in our two communities, by both the dedication of the association volunteers and staff, as well as through the use of innovative, flexible resources. Email Rose-Marie McKinnon or call 403-256-7306 for more information. We work together to be responsible and accountable to our residents, stakeholders, and to one another. We work together to support our stakeholders, and to address community concerns. We’re a community that supports fairness, and strives to be accessible to all residents of Midnapore and Sundance. We’re a community that’s always looking out for one another. Families are an integral part of the Mid-Sun Community Association. In keeping with the spirit of the community we’re volunteer-directed, and put our residents’ needs first. We celebrate individuality within our two communities while striving to maintain a mutual understanding and acceptance of one another. We’re committed to the well-being of our communities, and the people who live in them. Please contact facility.manager@midsun.org to discuss your ideas and our needs.